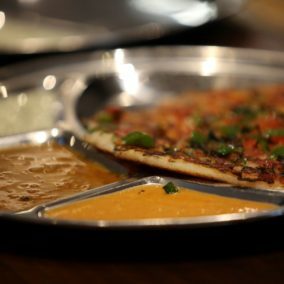 Our round platter consists of two curries of the day, dal(lentils of the day, a plate of rice, four freshly made hot chapattis a selected fried favourite (pokara etc) pickle, salad, poppadum’s, plain yogurt and if that’s not enough a sweet dish to finish. 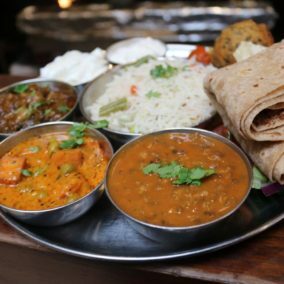 This thali is traditional home cooked food with a selection of over ten items served in small stainless bowls this dish is a complete meal. It’s a balanced, wholesome meal. Very delicious. Chef’s choice. This round platter consisting of everything in the thali and a little more, this a special treat. Enjoy the moment. Any additional items required will be charged at 95p each. 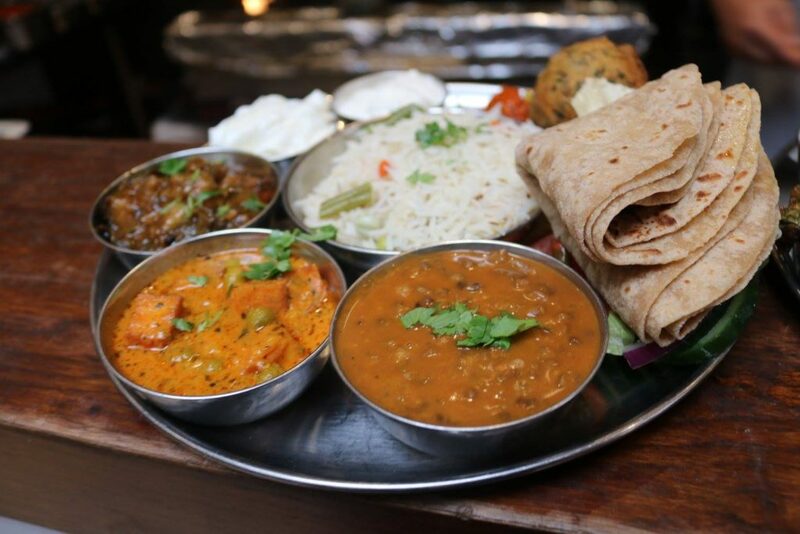 Our thali menu changes daily. A popular dish eaten all over India. Fluffy deep fried bread made from wheat flour accompanied with a simple dry spicy and tangy potato curry. Traditional and yummy. FOR THOSE WHO WANT TO ENJOY AT HOME – Box of 50 puris, potato and chick pea mixture for filling and fresh mint and coriander water accompanied with our house green chutney and tangy tamarind sauce. All to takeaway and enjoy in the comfort of your home. Small fried round pastry (puri). Fried round hollow pastry filled with potato & chick peas topped with tangy tamarind sauce and green chutney accompanied with a freshly prepared mint & coriander water. 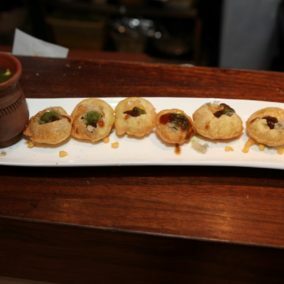 Fried round hollow pastry served with yellow peas stew like sauce to fill in the pastry accompanied with fresh mint & coriander water garnished with tamarind sauce. Flat crispy pastry (puri) topped with potatoes & chick peas mixture topped with thin crispy gram flour noodles (sev) garnished with green chutney and tangy tamarind sauce, onions & fresh coriander. 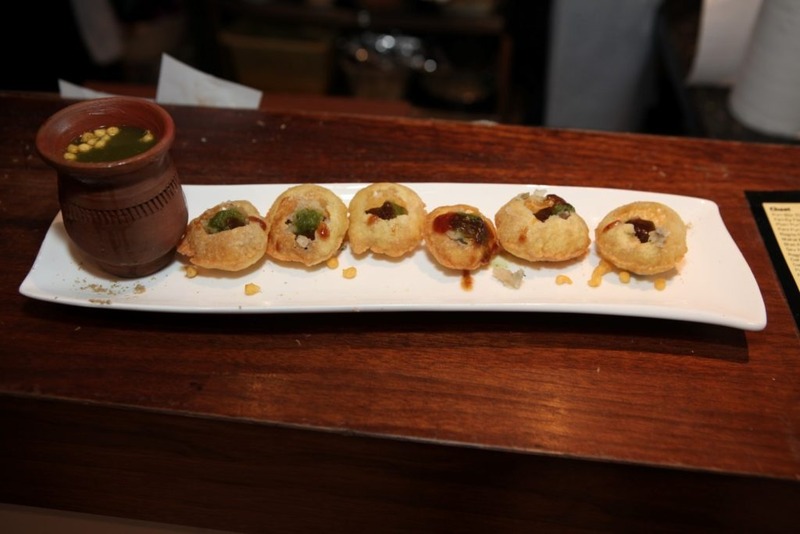 Variation to sev puri served with our yellow peas stew like sauce. Crispy round hollow pastry filled with mashed potato & chick peas filling topped with generously poured with yogurt garnished with coriander, green chutney and tamarind sauce. 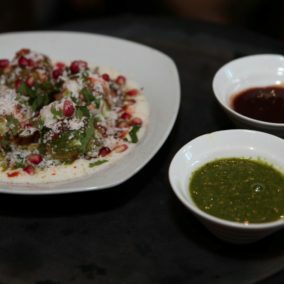 Fluffy lentil fried pokaras soaked in yogurt garnished with coriander pomegranate coconut, cumin powder & tamarind sauce. Savoury street snack combination of puffed rice & thin crispy gram flour noodles mixed with potatoes chick peas onions chaat masala blended with our fresh green chutney and tangy tamarind sauce. Crispy fried noodles tossed in sweet and spicy sauce topped with onion and coriander. Combination of flat puris blended with mashed potato thin gram flour noodles (sev) mixed with chaat masala yogurt coriander chutney tamarind sauce garnished with fresh coriander. 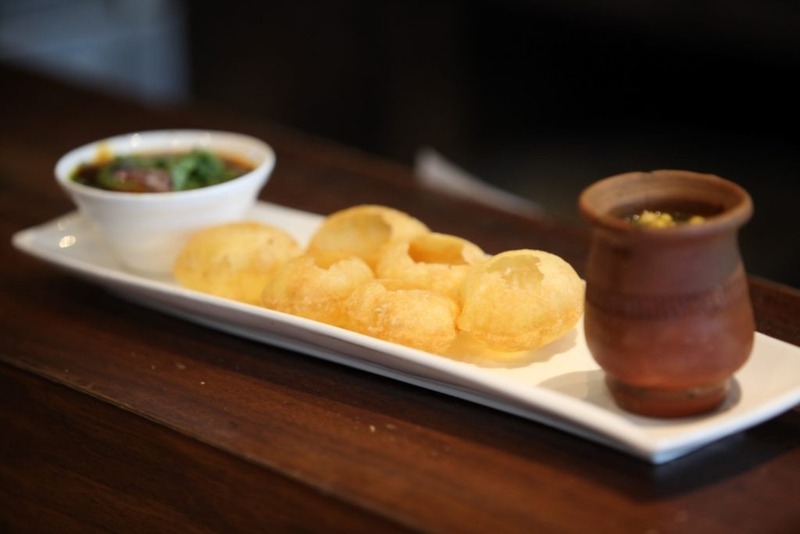 Our papdi chaat mixed with crispy fried potato. Crispy Chinese noodles thin slices of carrots & cabbage tossed in our chef special slightly sweet but tangy sauce. Chef’s Special. 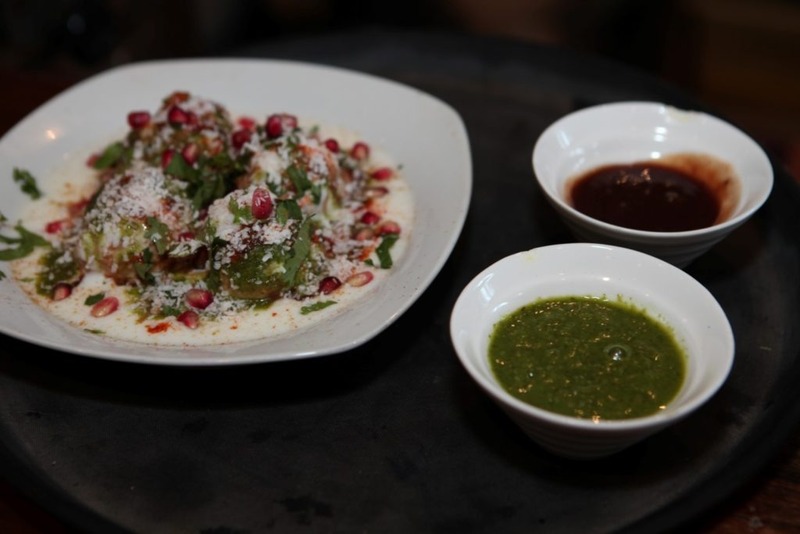 A fusion of south and north, soft rice cakes deep fried topped with yogurt green chutney and tamarind sauce garnished with onions and coriander. Pastry filled with potato & peas broken into pieces topped with yogurt and green chutney & tamarind sauce. A spicy taste of crispy samosa topped with chick pea curry, yogurt, green chutney, tamarind sauce fresh coriander. topped with green chutneys and tamarind sauce. Variation of samosa chaat topped with our spicy yellow peas stew-like sauce & chutneys & freshly chopped coriander. 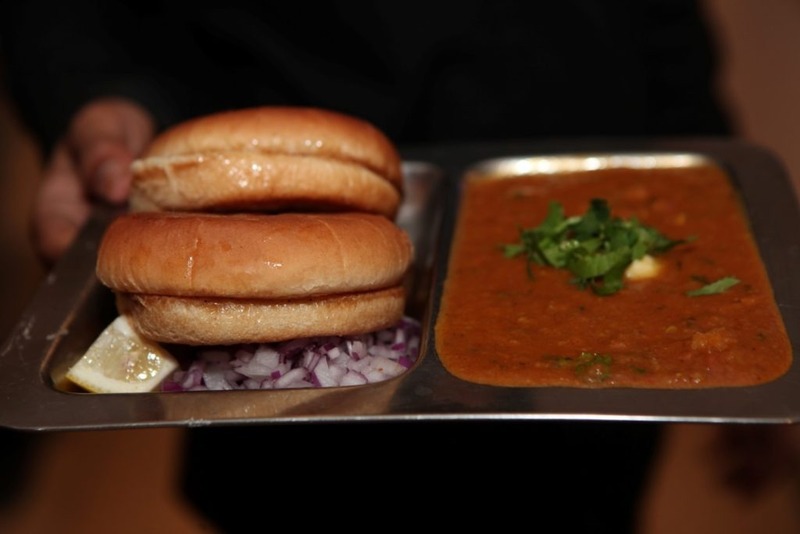 Spicy mashed potato patties served with yellow pea’s stew-like sauce topped with fresh onions and chutneys. A round flatten puff pastry stuffed with spicy baked yellow lentil mixture topped with yogurt, green chutney, tamarind sauce garnished with freshly chopped coriander & onions. Curried brown chick peas blended with (sev) thin gram flour noodles and topped with green chutney and tamarind sauce garnished with fresh onions and coriander. Spicy Mashed boiled Potato patties crisp on the outside soft inside topped with yogurt, green chutney & tangy tamarind sauce garnished with chopped onions and fresh coriander. Spiced mashed potato patties topped with our special pindi chaan chick peas curry garnished with green chutney and tamarind sauce. Spiced mash potato patties topped with a spicy chick pea curry garnished with onions green chutney, tangy tamarind sauce. Spicy tangy dish boiled potato and curried chick peas topped with green chutney and tamarind sauce. Veg patties topped with yogurt and green chutney and tangy tamarind sauce. Variation of bhel with sweet corn and cream. Healthy option boiled potato and chickpeas blended with chat masala special tangy spice lime, onion cucumber & fresh coriander. Healthy option sprouted mung beans blended with chat masala special tangy spice cucumber, tomato, onions, lime & coriander a refreshing flavour. The most famous Mumbai beach food, hot sizzling on our iron tava. A fresh mix veg curry unusually blended with special Mumbai species tossed in fresh onions and garlic, smashed and cooked over a high flame topped with pure anchor butter and served with soft slightly toasted bread rolls, chopped onions and lemon wedges. A must have, Chefs Choice. Pav bhaji topped with grated cheddar cheese. India’s version of a burger a simple creation of a deep fried spicy potato patty covered with batter placed in between a bread roll with special Mumbai (Ghatti) masala and chutneys. Served with green chillies. Mumbai’s local street food but so yummy. Vada pav covered with a full flavour cheddar cheese. A Spicy potato mixture combined with special masala chutney topped with peanuts and pomegranate all placed in between bread roll. Mumbai road side special. Dabeli topped with a full flavour cheddar cheese. Piping hot Spicy curry made with mixed beans topped with Bombay mix garnished with chopped onions and coriander. Served with lemon wedges and pav (rolls). Fresh vegetable patty blended with spices placed in between a burger bun topped with mayo dressing, onion, tomato, cucumber and creamy burger cheese. Served with crisps. Vegetable patty made with cottage cheese placed in between a burger bun topped with mayo, tomato cucumber, onions and burger cheese. Served with crisps. Our aloo tikkis (potato patties) placed in a burger bun topped with mayo, onions and burger cheese. Served with crisps. A toasted version of our classic sandwich grilled to perfection steams the veg inside the melted butter and cheese adds another dimension. 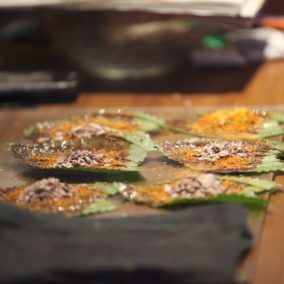 Cut into four triangles so that you handle all the layers, you will experience the most refreshing tangy spicy taste after each bite. Chef’s Choice. Lavishly buttered three white bread slices sandwiched between thin slices of boiled potato, cucumber, tomato, onions, peppers, green chutney, red garlic chutney spread, topped with cheese. Lavishly buttered bread slices topped with our special green and garlic chutney sandwiched between with spicy tandoori cottage cheese, topped with cucumber tomato onion and peppers all grilled to perfection. Buttered slice bread with fresh cucumber and tomato topped with grated cheese and all grilled to perfection. Easy simple and yummy. A classic cheddar cheese sandwich toasted to perfection. A classic cheddar cheese sandwich with chopped onions toasted to perfection. A classic cheddar cheese sandwich spiced up with fresh green chilli and chopped onions toasted to perfection. Sautéed cottage cheese in aromatic spices rolled in the wrap topped with salad and mayo. Chef’s Choice. Sauted mushrooms tossed with spices rolled in the wrap with salad and mayo. Indo Chinese Manchurian balls rolled in a wrap topped with Lettuce, onions and mayo this kathi brings a new dimension to a simple Manchurian. Chips topped with cheddar cheese. Chips mixed with cheddar cheese and garlic. Chips stir fried with house chilli sauce. Chips stir fried with coarse black pepper and fresh garlic. Chips fried and tossed with garlic and chefs special dry spices. Very tasty. Chips stir fried and tossed in tomato paste, fresh garlic and ginger. Masala chips stir fried and tossed in tomato paste, fresh garlic and ginger topped with grated cheddar cheese. Chef’s Choice. Tossed in soy sauce, green chilli, onion, peppers & spring onion. Plain rice and lentil crepe no fillings. 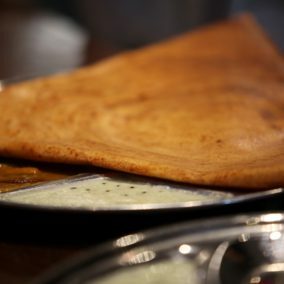 A plain dosa filled with our chef special potato and onion filling. Plain dosa made with ghee (clarified butter). 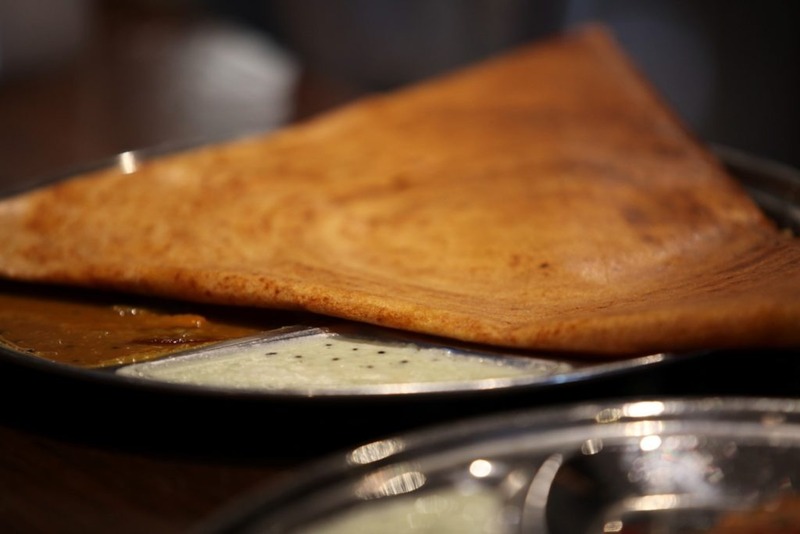 Crispy paper thin dosa is a super star in south and all over the world this dosa is golden brown crispy and so large you can not imagine. Paper dosa made with ghee (Clarified butter). Plain dosa spread with a special thick red chutney paste. Served as a triangle. Plain Mysore dosa filled with a spicy potato and onion filling. Mysore dosa topped with a special garlic chutney filled with potato and onion filling. Masala dosa with paneer (cottage cheese) pieces added to the filling. Plain dosa topped with cheddar cheese and chopped onions. Plain rice and lentil crepe topped with our special pav bhaji mixture lavished with butter. A delicious combination of spicy sauce cheesey dosa topped with onions pepper and lettuce. A delicious combination of spicy sauce cheesy dosa topped with onions peppers and lettuce. CHEF SPECIAL homemade south Indian dry red masala spread over our plain rice and lentil crepe. Plain rice and lentil crepe topped with melted Cadbury chocolate. Thick rice and lentil batter made into a pancake. Thick uttapam topped with chopped onions. Uttapam topped with fresh onions, carrots, peppers, fresh coriander and chilli. Uttapam topped with grated cheddar cheese. Uttapam topped with grated cheese and chopped onions. Doughnut-shape deep fried fritter made from lentil batter with spices. 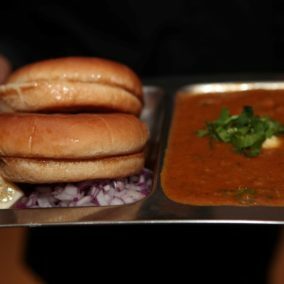 Vada has a crispy exterior and soft from the inside served with a variety of chutney and sambhar (lentil soup). Hot and steamy rice patties steamed to perfection served with a variety of chutney and hot sambhar (lentil soup). Traditional rice cakes stuffed with a special potato filling and steamed to perfection. Mogo fried and tossed in our house chilli sauce. Mogo fried and tossed in tomato paste, fresh ginger and garlic paste topped with coriander. Chef’s Choice. Mogo fried and tossed in coarse black pepper and fresh garlic. Mogo fried and tossed with garlic and chefs special dry spices. Very tasty. Deep fried patty made with delicious African cassava and other spices made to perfection. Thin slices of potato blended with fresh ginger garlic, green chilli paste and spices mixed in a batter fried till crispy. Served with a special cucumber and carrot chutney. A house speciality. A must have, Chef’s Choice. A deep fried fritter made of gram flour and freshly chopped fenugreek leaves with spices, served piping hot with special green chutney and fried green chillies. Chef’s choice. A Mumbai street food snack made from a mixed lentil batter served with coconut chutney. Special large chilli spiced and dipped in gram flour batter and deep fried. Spiced mashed potato balls dipped in gram flour batter and deep fried, served with green chutney. This is an iconic dish of the streets of Mumbai and is scrumptious. Chef’s Choice. Cottage cheese (paneer) dipped in a gram flour batter, blended with spices and deep fried. A real delicacy. 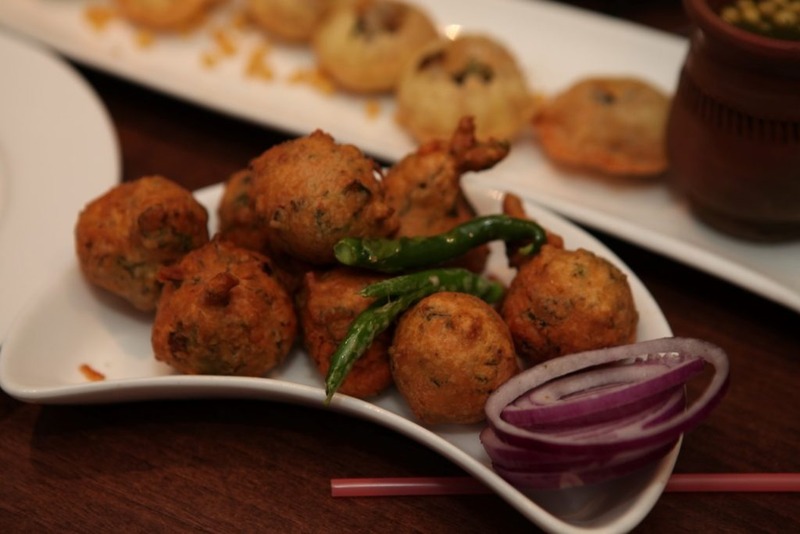 Sliced potato, each slice coated completely with gram flour batter deep fried to a fluffy fritter. A pastry stuffed with spicy pigeon pea filling and deep fried. Very delicious. Spicy mashed boiled potato patties crisp on the outside soft inside served with our house chutney. A real treat. Deep fried veg patties stuffed with a spicy mixed veg. 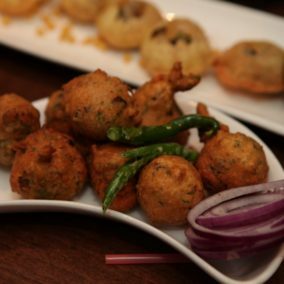 Thin slices of OKRA dipped in a spicy gram flour batter and deep fried in to an amazing crunchy snack. (A must have) not to be missed. Deep fried Maharashtrian snack made with sago/tapioca pearls and spices. Super delicious. Vegetarian alternative to kebabs, fresh vegetables and spinach blended with spices made into a patty. Crispy croquette made with sweet corn, fresh vegetables and spices. Mouthwatering. Must have. Crisp coat filled with yummy cheddar cheese. Unique taste with every bite. A thin wheat flour pastry filled with a spicy mixed veg filling then deep fried till golden brown. A puffy pastry stuffed with a delicious filling of potatoes, peas and spices then deep fried till golden brown. A Mumbai cinema special. 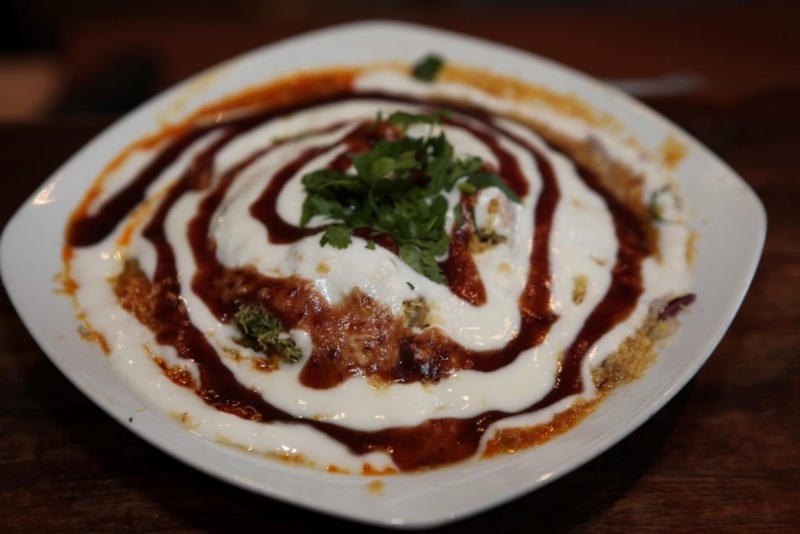 Chunks of cottage cheese marinated in authentic spices and grilled in a tandoor. Chunks of cottage cheese marinated in yogurt and spices grilled in a tandoor to perfection..
Popular punjabi appetiser made with cottage cheese cubes marinated in spicy pickle masala and cooked in a tandoor to perfection. Fresh mushrooms marinated and stuffed with chefs special potato and cottage cheese filling, cooked in the tandoor to perfection. Sliced cottage cheese tossed in hot, spicy chilli and soy sauce, peppers and onions garnished with spring onions. This dry spicy dish is a hot favourite. Cottage cheese stir fried in a wok, flavoured with lightly sweet, sour and spicy mix. Topped with sesame seeds to add that crunch. Chefs Choice. Cottage cheese dipped in batter and tossed fresh chopped ginger garlic mixed with red and green peppers and onion spiced with black pepper. Small crispy pieces of paneer tossed in salt and papper. Cottage cheese cubes cooked in a rich creamy gravy with spices. Mushroom slices tossed with garlic and soy sauce. Whole mushroom covered in a batter deep fried and tossed in our chef special sauce. Broccoli is cooked in many ways but this dish is something special. Broccoli pieces dipped in batter, deep fried and tossed in our chef special sauce is just yummy. Chefs Choice. Crispy fresh vegetables tossed in ginger, garlic, spring onion and green chilli. Fresh mix veg wok fried to perfection with soy sauce. Long strips of aubergine stir fried with soy sauce, fresh garlic and spices. Special crispy preparation of sweet corn kernels coated with batter deep fried and tossed with spices. Crispy fried noodles tossed in sweet and spicy sauce topped with onion, coriander. Crispy Chinese noodles thin slices of carrots & cabbage tossed in our chef special slightly sweet but tangy sauce. Chef special. A house special our Manchurian balls are prepared with fresh carrot and cauliflower, deep fried and mixed in our chefs special Manchurian sauce. This dish is truly amazing. Veg Manchurian gravy is yet another deliciously spicy and soupy variation prepared with the Manchurian balls. Kathiyawad is a peninsula in western India and a part of the Saurastha Gujarat region, the dishes below are the star dishes of this region wholesome and full of flavours. Undhiyu is a one pot casserole of special mix vegetables cooked to perfection with special spices, this curry is the hallmark of Gujarati vegetarians and a must have dish. A hot spicy yogurt soup mixed with pigeon peas. Its simply yummy. Hot and steamy combination of yellow lentil and rice tempered with species and garlic topped with coriander. A traditional Gujarati flat bread made from millet flour best topped with butter. Served with garlic chutney and jaggery. Flat bread made of wheat like a chapatti stuffed with sweet saffron and cardamom flavoured lentil filling. Fluffy deep fried bread made from wheat flour. Assorted vegetables cooked in a special butter gravy. Assorted vegetables cooked in tasty spices and special gravy slightly on the dry side. Whole cashews and green peas cooked in rich creamy tomato and butter gravy amazingly tasty bom. Simple spiced potato curry. A simple yet very popular dish. Simple spiced potatoes curry. A simple but yet very popular dish. Potatoes and green peas cooked in a traditional tomato gravy simple & delicious. Chick peas traditionally cooked in a fresh tomato, onion, garlic and ginger gravy blended with whole spices. Chick Peas curry cooked in classic preparation from Punjab full of flavours cooked in a traditional gravy. Corn kernels and fresh fenugreek cooked in a mild and rich curry. Red kidney beans cooked in a thick curry sauce made of whole dry fresh spices and tomato. Fresh aubergine prepared in a vibrant tomato gravy blended with spices. This dish is full of flavours. Cut okra blended with spices, fresh ginger and garlic tossed with onions and peppers. Preparation of vegetable dumplings simmered in a special saffron and creamy tomato gravy. Soft round cottage cheese balls cooked in a rich creamy tomato and onion gravy. 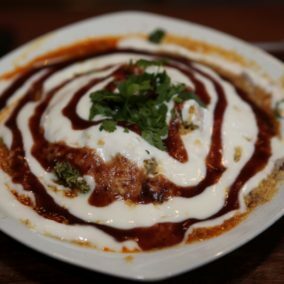 Our chefs special makhani paneer is cottage cheese simmered in a tomato, almond and onion gravy cooked in traditional spices and topped with fresh cream. Simple but finger licking. Chef’s Choice. Popular Punjabi curry, a perfect combination of cream butter and spices in a thick tomato gravy. Scrambled cottage cheese sauteed in fresh onions and tomato with spices. Cottage cheese and green peas cooked in a tomato based gravy spiced with masalas. Deliciously creamy spinach mixed with cubes of fried cottage cheese, thickened with a creamy sauce and spices. So authentic and a must have at Mumbai local. Cottage cheese chunks and mushrooms cooked in a spiced creamy gravy cooked to perfection. Yellow lentil soup tempered with spices and fresh herbs garnished with fresh coriander, served hot and steamy. Thick creamy black Lentils cooked to perfection and tempered with species. Chef’s choice. Yellow lentil soup tempered with spices mixed with fresh spinach. One of the most healthiest and authentic curries. Steamed wheat noodles stir fried and tossed with a variety of vegetables. Simple and non-spicy amazingly tasty. Our chef special schezwan sauce made with fiery spices and condiment, holds an indispensable place in our Indo Chinese kitchen. The schezwan hakka noodles preparation of wheat noodles tossed with vegetables and our schezwan sauce. Chef’s Choice. 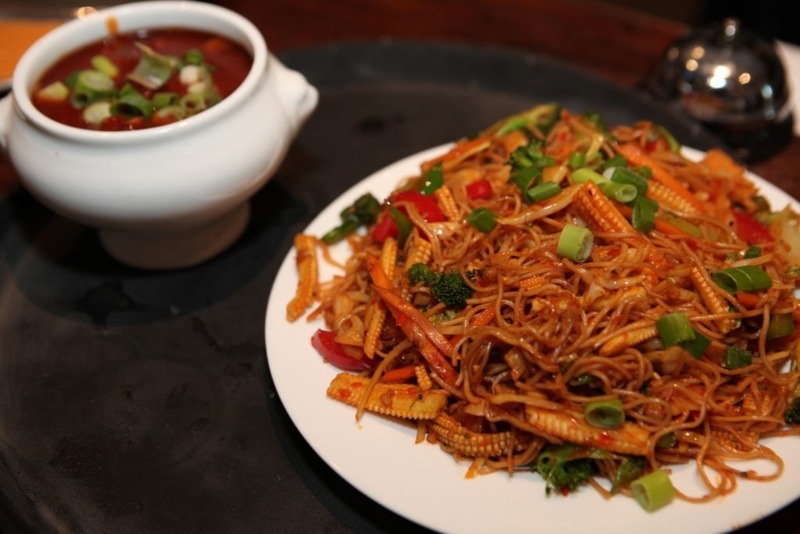 Try our special mix of vegetable Hakka noodles and fried rice tossed in a wok. This is a superb combination. 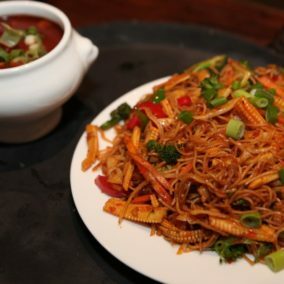 Hakka noodles and fried rice mix with our special schezwan sauce. It’s heavenly for the spicy eaters. A veg fried rice tossed in our hot and spicy house schezwan sauce. Mumbai local schezwan sauce is made from fresh ingredients it’s a totally unique blend. Plain aromatic steamed basmati rice full of flavour. Basmati rice dish tempered with cumin seeds. Steamed rice that has been fried in a wok. Steamed rice stir fried with fresh vegetables in a wok. One of the most popular dishes. A veg fried rice tossed in our hot and spicy house schezwan sauce. Mumbai local schezwan sauce is made from fresh ingredients, it’s a totally unique blend. Our Chef’s Special. Perfect combination of fluffy basmati rice tossed in spiced onions and peppers. One pot meal healthy fresh green spinach sautéed with spices and tossed in aromatic basmati rice. 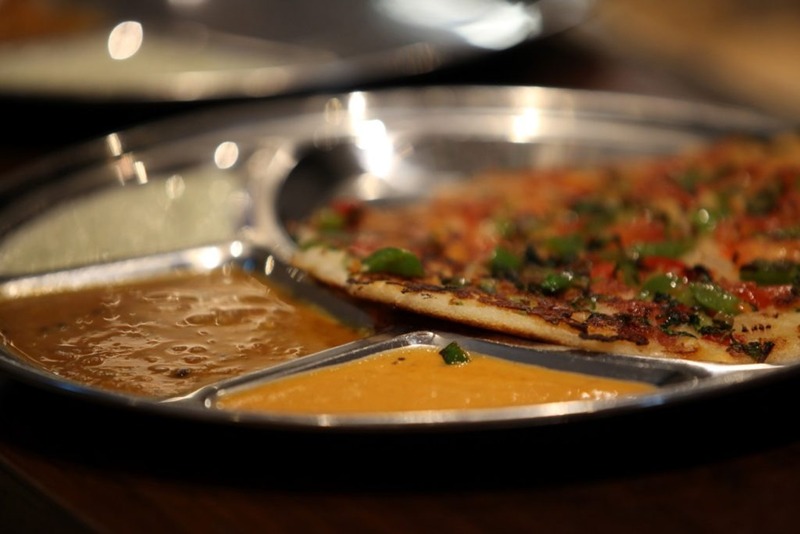 A thin flat bread made of wheat flour cooked dry in tandoor served with or without ghee (butter). Famous north Indian fluffy bread cooked in a Tandoor best topped with butter. Fluffy bread with chilli and fresh garlic. A thin flat bread made of wheat flour cooked dry on a tava, served with or without ghee (butter). A fluffy thick deep fried bread blended with dry fenugreek and other spices, best served piping hot. A large layered flaky bread prepared with wheat flour traditionally cooked in ghee (clarified butter) on a tava. A spicy mashed potato mixture is used as a stuffing for the flat wheat bread served with a mix pickle and plain yogurt. It’s simply so yummy. Chef’s Choice. Cottage cheese grated and blended with spring onions and spices, stuffed in a bread. Cooked on our iron tava topped with butter. A traditional Gujrati flat bread made from millet flour best topped with butter. Served with garlic chutney and jaggery. Flat bread made of wheat like a chapatti stuffed with sweet saffron and cardamom flavoured lentil filling. A must have Chefs choice. Soft wheat flour flat bread blended with fresh green fenugreek leafs and spices. Gujrati special. Fried plain papadum’s topped with finely chopped cucumber, onion, and tomatoes blended with chaat masala. Roasted plain papadum’s topped with finely chopped cucumber, onion, and tomatoes blended with chaat masala. Yogurt mixed with cucumber and cumin powder. A freshly squeezed lime juice slightly sweetened and salted. This drink is just refreshing. A very tasty and energising juice made from fresh passion fruit. One glass is not enough. A superb blend of carrots, orange, pineapple and passion fruit. A must have Chef’s Favourite. Mix your own juice – let us know what you want and we will juice it for you. A sweet or savoury Indian yogurt drink. Yogurt drink blended with mango pulp. 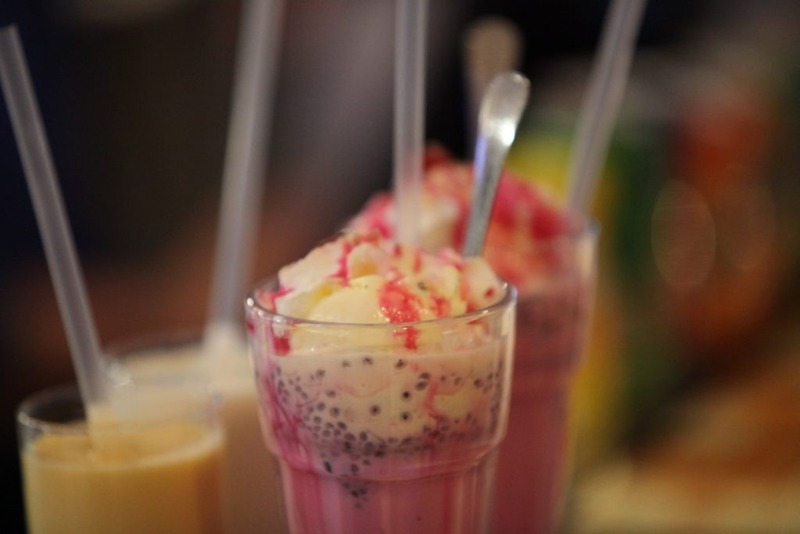 A cold dessert like drink traditionally made with a layers of vermicelli, fruits, basil seeds, with a cold rose milkshake poured in the long glass topped with a scoop of vanilla ice-cream and if that’s not enough we squeeze fresh cream topped with nuts, and cherry. Amazing to look at, more delicious and yummy to drink. topped with ice cream and fresh cream garnished with nuts and cherries. 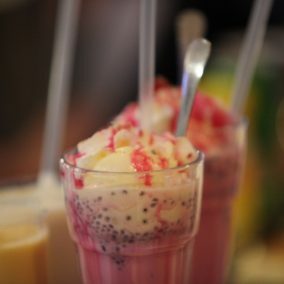 A glass of fresh milk blended with rose syrup. A glass of fresh milk. (Traditionally sugared but can be made without sugar). 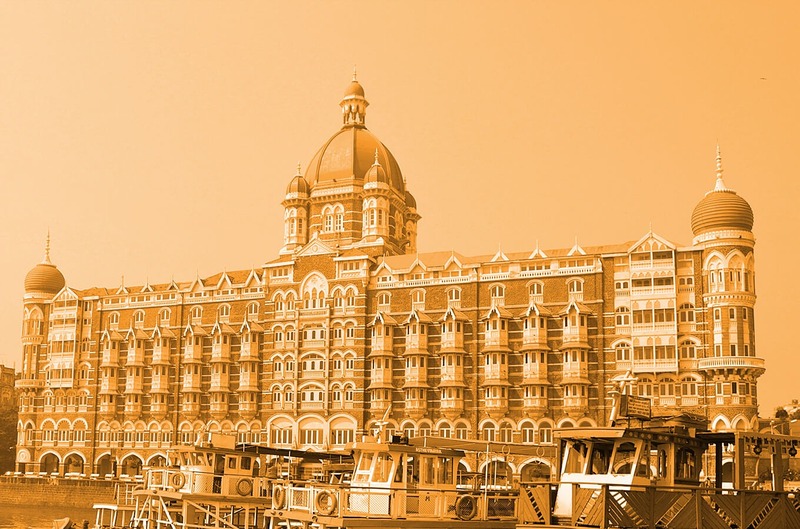 The special Mumbai tea which has been passionately blended with spices to perfection. Exclusive to Mumbai local this has to be tried by all tea lovers. A must have. Indian milky coffee or English, as you like it we will make it. A jug of nimbu pani. Jug of lassi sweet or salted. A jug of mango lassi. A jug of fresh passion fruit juice. Small balls made of milk powder deep fried and dipped in sugar syrup flavoured with saffron and cardamom. This traditional rich sweet is a naughty but nice treat. Creamy milky dessert with soft and spongy cottage cheese patties dipped in saffron flavored milk. A must have. Eggless preparation of chocolate flavoured cake with chocolate filling served with vanilla ice-cream. Must have. A sweet dish made of strained yogurt added with sugar, flavoured with saffron, cardamoms and topped with nuts. 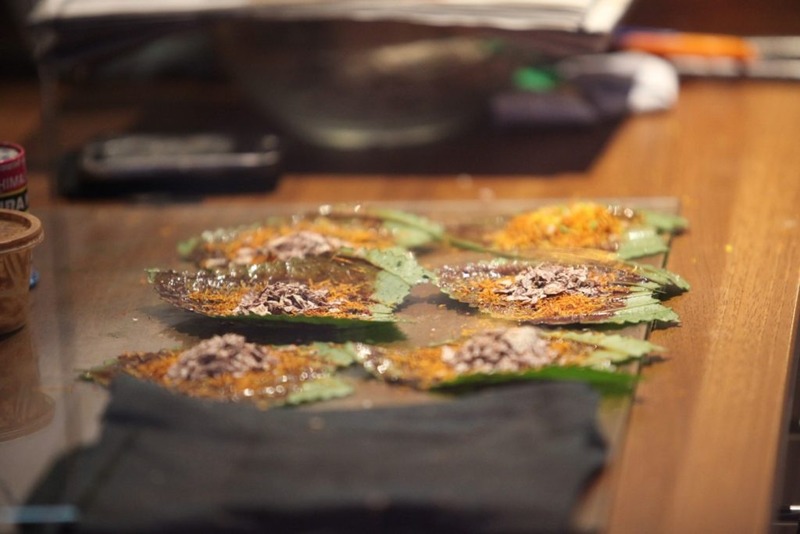 A preparation made with betel leaf and various mouth fresheners sweet in taste. It just completes your meal. Nut Allergy: some of our food may contain traces of nuts. Please ask a member of staff for advice. We will do our best to meet any special requests. We now do home delivery from midday to 8.30pm seven days a week covering postcode areas HA0, HA9 and UB6.  You can now order through Deliveroo. © Copyright Mumbai Local 2016. All rights reserved.